"[dih-sem-buhl] Show IPA verb,dis·sem·bled, dis·sem·bling. to give a false or misleading appearance to; conceal the truth or real nature of: to dissemble one's incompetence in business. to put on the appearance of; feign: to dissemble innocence. Obsolete . to let pass unnoticed; ignore." Reportedly, Ansar Al Islam an affiliate of Al Qaida, waged the heavily armed attack. They are a radical The attack was waged with RPGs by more than 100 radical Islamic terrorists. During the summer of 2012 a determination was made to end Consulate protection by Seals at the Consulate. That decision was made by Charlene Lamb, Deputy Assistant Secretary of State at the State Department. United States Special Forces were replaced with a contracted out force of local private security, The February 17th Brigade, a known radical Islamic Group. The contract to this group is what prompted Eric Allen Nordstrom to say, "The Taliban is in the building" in his testimony to the Committee On Oversight & Government Reform Hearing on Security Failures when he appeared before the committee on October 10, 2012. The consulate was under siege for 5-6 hours. The attack was waged by groups with many different group names and alliances of Radical Islamist who control western Libya. During that time frame we now know that the Department of State was watching a live feed from the Consulate from consulate security equipment and drones flying over the Consulate. On September 12, 2012, the morning after America's Consulate in Benghazi was attacked by radical Islamic Extremists the Distortions began. 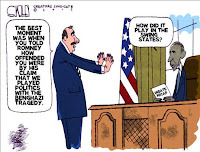 According to government officials at the highest tier of American governance and appointees of the Obama Administration amazingly the riots America witnessed worldwide were caused “by an offensive YouTube.” The Obama Administration had the audacity to repeatedly claim and maintain and imply that an out of control crowd of distressed protesters who sacked and burned the Consulate in Benghazi were not to blame because the YouTube was so offensive to Muslims it caused this reaction. What high ranking government officials did not report was that the YouTube was aired on Al Jazeera TV. Prompting Mullahs to give fiery speeches inflaming their followers to riot at encouraging violent demonstrations US Embassies. All of this from the "Religion of Peace." The resulting violent protest worldwide, showed Al Qaida flags being raised over our Embassies. United States Embassies throughout Islamic governed nations were burned sacked and damaged worldwide. The lies and misrepresentations from the Obama administration continued with little regard of truth or honesty. The never-ending relentless attempts to protect Obama's failed Middle East policies were limitless. Obama stood in the well of the UN and proclaimed the violence a result of the obscure YouTube. Vice President Biden threw the CIA under the Bus in his The Vice Presidential Debate with Vice Presidential Candidate Congressman Paul Ryan. Recently Obama has stopped saying Al Qaida is on the run. I wager in light of the September Benghazi attacks that his handlers have indicated that line is not working for him. 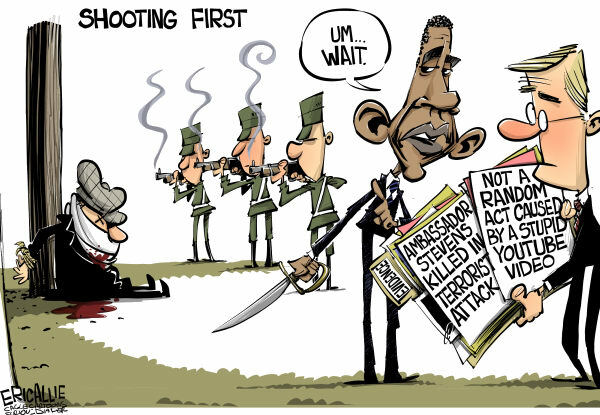 Obama's clumsiness continues as he call the deaths of Ambassador Stevens and his team not optimal. According to this link, Obama is contemplating an attack on Libya. Who does he plan on striking? The ghost in the desert? I say any strike is a month and 18 days shy of being relevant. He knew from the live feed on the night of the attacks the men in Benghazi desperately needed help and he did nothing. but his team did concoct a vile lie of deception, to mask his betrayal. There are a myriad of stories, several articles claim the Obama Administration arranged for Ambassador Stevens to be kidnapped and exchanged for the Blind Sheikh, mastermind of the first bombing of the World Trade Center in New York City. One can certainly question the very bizarre ending of the Presidential Townhall, moderated by CNN's Candy Crowley in what appears to have been a set-up to provide Obama an opportunity to upstage Mitt Romney. There are others that claim that the two specops members of the Embassy Team(Doherty and Woods) were private contractors were CIA agents sent as part of the Ambassador's Team to Libya to buy back munitions given to insurgents in Libya during the overthrow of Gadaffi government: "He and Ambassador Stevens, as well as the two other special operators from Wind Zero, were executing a CIA and State Department mission to track not on Gaddafi's weapons, but to trace any and all weapons trafficking in the regions. Smith was the information officer at the Benghazi mission and was too close to having uncovered intelligence that pinpointed key players both inside and outside of Libya. Intelligence was shared with the CIA, which does not support the drone program, whether inside Libya, stemming from the mission to remove Gadaffi, or in other hot spots in the Middle East" This link and this link give some credence to this story line. This link also suggests a far different narrative than the one we have been given by the Obama Administration. It, too makes reference to why exactly Stevens and his team were in Benghazi. This link is a follow up and second part of the links above, and is must read information. Denise Simon states: "As a result the clear conclusion is President Obama as well as the Secretaries of State and Defense would rather eliminate all visible deterrents of protection and security that offend Muslim sensibilities and have in fact done so, sadly, even with the approval of the Joint Chief, General Martin Dempsey." John Bolton former US Ambassador to the UN, in his summation at the end of this article says: "Some characterize Obama's line of argument as a cover-up, an accusation the president theatrically denied during the town hall debate. Willful and repeated misrepresentation is certainly consistent with a cover-up, but it is also consistent with a presidential ideology that is so powerful and pervasive that facts and reality that don't conform to the worldview derived from the ideology are simply rejected. Rather than facts changing the worldview, precisely the opposite happens for Obama. The discordant facts are screened from the president's consciousness and rejected. The Obama storyline is that the "war on terror" is over, al-Qaida has been defeated, and Gaddafi's overthrow and the Arab Spring are bringing democracy to Libya. This worldview is also, coincidentally of course, very helpful to the president politically. In fact, however, the reality is quite different from Obama's ideology on all three of these points, as tragically demonstrated in Benghazi on 11 September, notwithstanding the president's stubborn unwillingness to acknowledge it. Thus, Tuesday's debate hardly constitutes a rejection of the Romney assessment, which is solidly grounded in facts, and is being constantly reinforced as new facts come to light. Candy Crowley and her media colleagues may have taken a momentary delight in coming to Obama's side in the debate, but the American people will ultimately not be deceived. The citizen questioner in Long Island has a question that remains unanswered, and there are many more like it. And there are still three weeks until the election." In this article from National Review Online Andrew C. McCarthy closes with: "In Benghazi we see the wages of the disease, The Pathogen was not a video. Want to know why our people were left unprotected and why mounds of intelligence foreshadowing peril were ignored? Don't look to Obama's vice president, look to Obama's policy." We may never really know with any conviction the truth of what transpired on that horrible nightmare night of September the 11th in Benghazi. I am not sure what to make of the storyline that Ambassador Stevens was to be kidnapped and traded for the Blind Sheikh in an "October Surprise". Given the sleaziness of the Obama Administration and his penchant for anarchy and making his own rules as he careens along I suppose anything is possible. The weapons issue, sounds more than plausible. What we do know for certain is that Ambassador Stevens feared for his life, and that when the Consulate in Libya was under assault the Obama Administration did nothing. 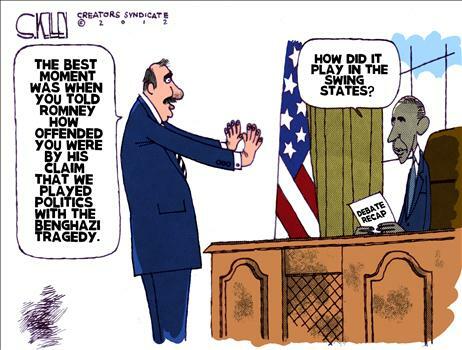 When they Knew factually in real time what was happening in Benghazi THEY DID NOTHING. My question remains WHY? Great piece. Amazing how anyone who considers what has transpired over the last 4 weeks (4 years actually) could even consider supporting this "president". He has failed miserably in every challenge. This incredible blog post, in its entirety, is now my FB status. Great blog, one of the best Ive encountered. I learned that Stevens was sent only 3 weeks prior. I believe with all my heart, Obama is practicing genocide. Navy SEALs are dropping like flies, people are "committing suicide". It's a sad time, a concerning time.